“Collagen is the most abundant protein in the body and helps give structure to our hair, skin, nails, bones, ligaments and tendons in our body. Thanks to collagen, we’re better able to move, bend and stretch. Collagen is also behind helping hair shine, skin glow and nails stay strong. . 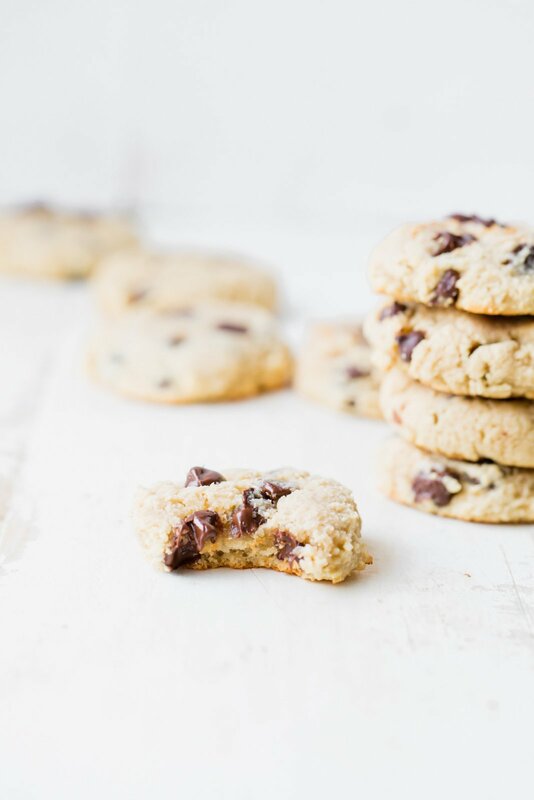 These almond flour chocolate chip cookies ARE so delicious, soft and are packed with collagen protein. 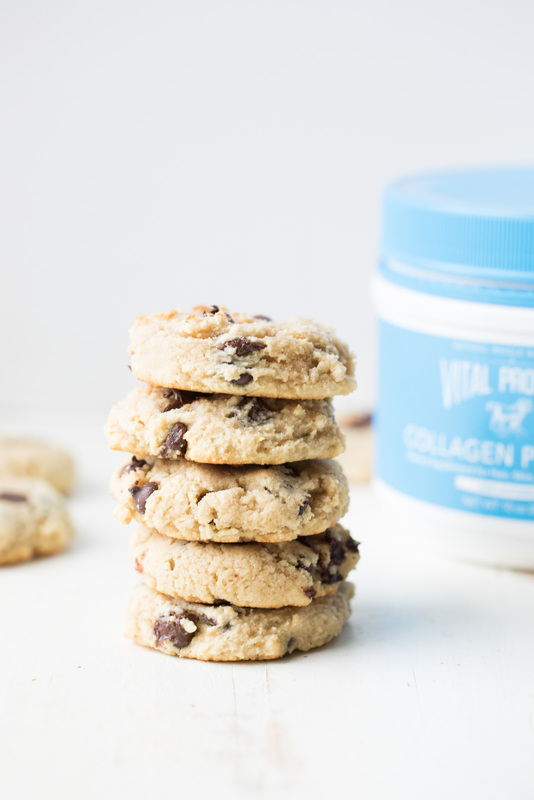 I love using the Vital Proteins Collagen Peptides in my baking recipes lately is because it’s odorless, tasteless and mixes incredibly well — so basically it just adds protein. It’s also incredible in smoothies because it gives them a thick milkshake-like consistency. You can even mix it into your coffee for a little boost in the AM. Trust me, you are going to LOVE it. If you’re looking for a simple, easy to make cookie recipes that pack a little bit of protein, this is it. 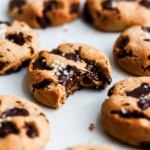 These cookies also happen to be grain free. I hope you get a chance to try these delicious, soft cookies that are perfect for a healthier snack or afternoon treat. 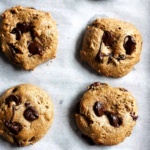 Almond Flour Chocolate Chip Cookies + video! 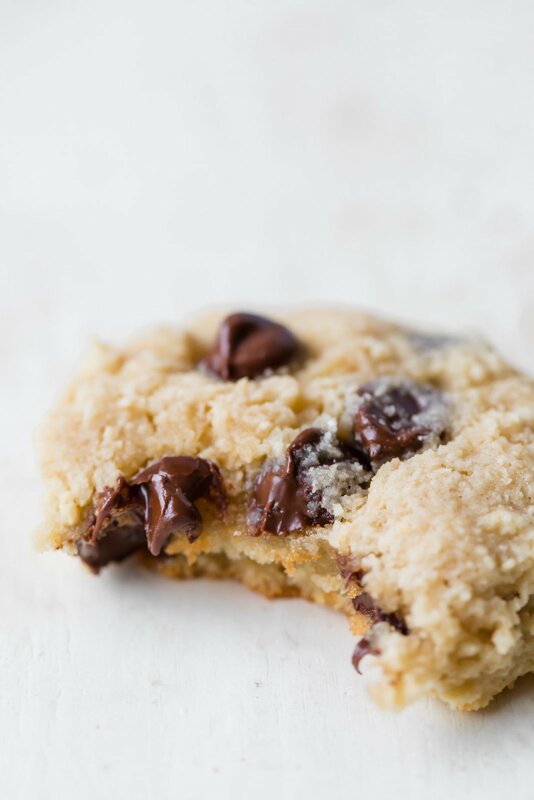 Deliciously soft, paleo almond flour chocolate chip cookies with gooey chocolate in every bite. 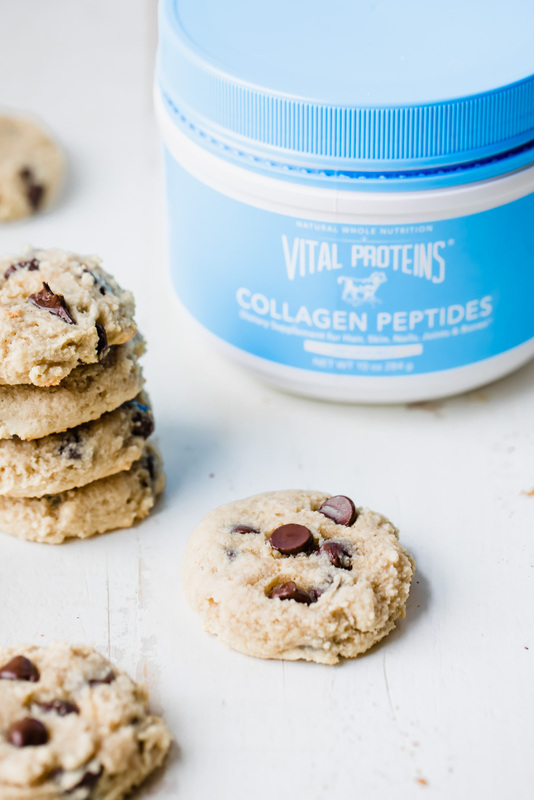 These cookies have a punch of protein thanks to Vital Proteins Collagen Peptides, and are the perfect weekday treat! In a large bowl, mix together ghee/melted butter, pure maple syrup, eggs and vanilla extract until smooth. Next stir in almond flour, baking soda, salt and Vital Proteins Collagen Peptides until just combined. Fold in chocolate chips. Drop dough onto prepared baking sheet about 2 inches apart. Use your hands to flatten the dough so that it’s about 1/4th inch thick. Bake for 10-12 minutes until cookies just begin to turn golden brown on the edges. They may look underdone, but that’s just because they’re made with almond flour. Allow cookies to cool for 5-10 minutes on baking sheet before transferring to a wire rack to finish cooling. Enjoy with a glass of your favorite nondairy milk or freeze them for later! Makes about 14 cookies. This post is in partnership with Vital Proteins, a Chicago based brand I know and trust. Thanks for supporting AK and the brands that help make this site possible! 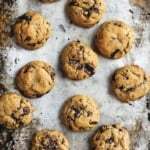 51 Responses to "Almond Flour Chocolate Chip Cookies + why you need collagen in your life"
Do you have to add in the protein powder? I don’t have but would like to try recipe without, and wonder if it would change anything other than it’s protein component. 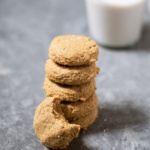 The collagen peptides in here give the cookies their soft texture, so I wouldn’t recommend leaving it out! YEASSSS to these cookies! I need to find a collagen that I like, so I’m totally trying this one! I love the idea of adding collagen to cookies, and the ingredient list is nice and short, score! Just made them! They are great! amazing flavor! and a great way to use up my collagen. I find it hard to remember to use it regularly but cookies… I will def be remembering to get my daily dose of collagen! Yes! Love Vital Proteins Collagen Peptides. I put it in my smoothies every morning. It blends super well and doesn’t alter the flavor at all. Isn’t it amazing?? I love how thick the smoothies get! Could the Vital Proteins Marine Collagen be used in this recipe? Yes that should work well! Hi Monique- have you ever used the marine collagen peptides in this recipe? If not have you tried using it in other ways? Thanks! Hi Sarah! I haven’t tried using the marine collagen peptides in here, but I think it will work equally as well 🙂 I’ve heard amazing things about it! Can I use my Aloha protein vanilla powder? That’s what I have in my pantry. Hi Elizabeth! 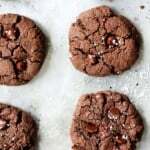 The consistency might be a bit different in these cookies, but let me know how it works out! Thank you for this recipe and all of your delicious recipes! I followed this recipe exactly and its great! Wow, I wanted to bake a quick batch of something to bring to a friends house. These were SO quick and easy. Perfect! So glad you enjoyed these! What a great healthy afternoon snack! I love that it includes collagen, i have never thought to add it in cookie dough! Thank you for the recipe! So good! Just made them! Perfect texture and taste! I’m so happy you enjoyed these!! I tried to view your video to see if I had the correct consistency before I put them in the oven (which was super super sticky and much more moist than regular cookies) but the video had only sound and no picture. And was about 1:30 seconds long. Anyone else have this issue? Or the issue with the texture of the dough? Thanks! Hi Katie! Very strange – it looks like the video is playing correctly on my end, so let me know if it is still an issue! 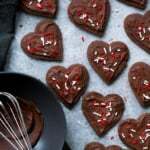 The dough will be more moist than regular cookies, and they will come out softer as well. Hope you enjoy them! Any substitute for the protein powder as I don’t get it where I stay. Can I leave it out? Please suggest. Hi Niti! You can leave it out 🙂 Enjoy! Is the maple syrup used as a sweetening agent? I would like to cut down on the carbs in these cookies. Can I use stevia or erythritol as a substitute? Hi! Yes it helps to sweeten these cookies a bit. I’ve never baked with stevia or erythritol, but I think they should be okay in here! These are really good. Very soft and moist. They don’t look as fluffy as your pic but they taste great. I think it is because I don’t have blanched almond flour. So glad you like them! Blanched almond flour does help. Wanted to try something without flour. 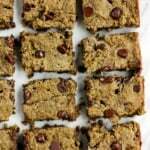 Almond flour is great as kids will also eat something good. Loved it . Thanks for the share. I would prefer to use xylitol powder or liquid stevia since that is what I keep on hand to cut down on sweets. Could you instruct me how I could do that? Hi! I’ve never baked with those sweeteners, so I’m not 100% sure. Sorry! Could I use a different protein powder? I’m currently doing Herbalife and I’m looking for different recipes I can try with the products I have. Hi can I replace maple syrup with granulated Erythritol/monk fruit sweetener? I’m just not sure because maple syrup is liquid form so changing it to granules would probably alter the texture or consistency? I usually get them at Whole Foods or online here! Our Targets have them now!